Primetime Pricing: Can Ticket Sales Predict MNF TV Ratings? We have long held a belief here at the NFL quadrant of the SeatGeek Blog that Primetime games are not only great for ratings, but give a nice bump in average ticket price. Is this true? Well, it makes sense. More people watch TV at night, and the night games are standalone games, up against no other NFL game. 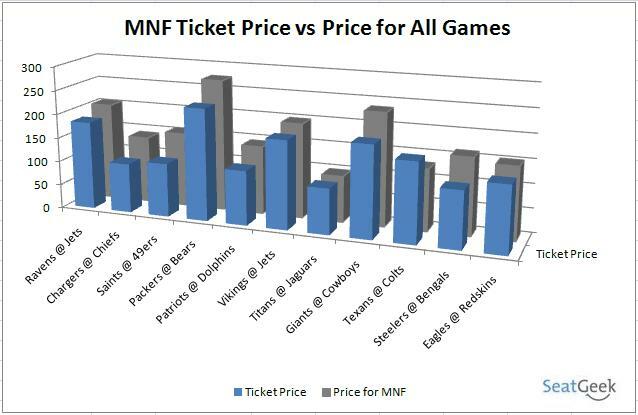 However, the true test of this theory lies in the ratings and average ticket prices for Monday Night Football. Monday Night Football used to be football night, it used to be the best game of the week. That all ended when ESPN tookover MNF starting with the 2006 season, moving the program to cable network for the first time. With network TV, specifically NBC, taking over Sunday Night, and getting the ability to flex late-season games into the Sunday Night slot in hope of a better matchup, Sunday Night is now football night. Sunday Night Football is getting the better games, higher profile teams. Monday Night Football is then the true test of how much primetime games help tickets and ratings, because they might not be the best matchups in the biggest markets. They are on work days, which make it a little more of a nuisance to attend. 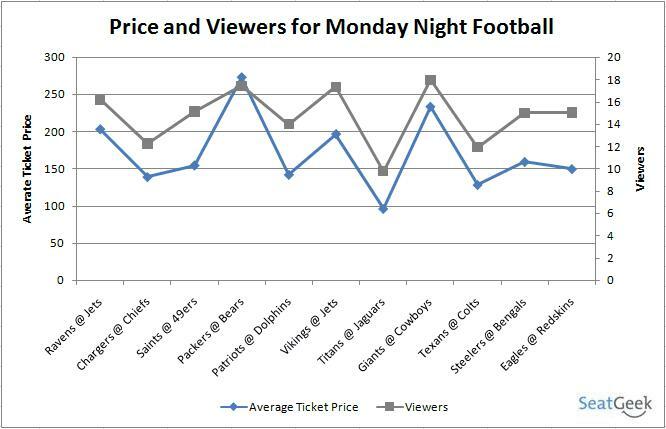 That all said, the data seems to prove that Monday Night Football does, in fact, boost ticket prices and ratings. So far, there have been eleven Monday Night Football games, featuring matchups like Brett Favre’s return to New York, to the first game in the renovated Arrowhead, to a seemingly average game featuring the Titans and Jaguars. Eleven games, eight divisional games with an average ticket price of $170.38. One cannot gain anything from that number without any context. A good way to measure the impact is looking at that price in relation to the average ticket price of teams that hosted Monday Night games for all games, which is $148.48, which shows that there is a 14.75% increase on ticket prices for Monday Night games. Except for the Texans @ Colts game, all ten games saw their home team get a price bump from having a game on Monday Night Football. The largest increase was the Saints @ 49ers game, where the 49ers tickets were 38.5% higher than the average 49ers game. The Titans @ Jaguars game was the lowest, with an average ticket price just 1.14% above most Jaguars game. This still signals a positive sign for the Jaguars, as they sold out the Monday Night Game quicker than any other home game all season. The Texans @ Colts game is an outlier, but a very strange one. That game featured two divisional rivals who were both 4-2, and the winner was to take control of first place in the division. The Colts were out for revenge after their 34-24 loss in Week 1 to the Texans. The average price for all Colts games are at $165.21, but the average price for the Monday Night Football game was $128.08, a decrease of 22.47%. For once, there is no good explanation for this. We have already seen in the past that bye weeks usually raise prices, so this drop is even stranger. Even with the weird result of the average ticket price of the Texans @ Colts game, the overall picture has been painted. Having a game on Monday Night Football, despite it not being an amazing matchup (mostly) and being on a work-day, will raise the average ticket price. The other arena we want to investigate is how the average price of a game correlates to TV ratings. Big markets have higher prices, and big markets also have more people to watch their games. However, the NFL has long been the one league that doesn’t have these problems. At the start of the World Series, a major story was that FOX would be upset that they didn’t get the Yankees and Phillies, who were bigger draws. The NFL never has this problem for the Super Bowl. The Jaguars and Panthers (the smallest market in each conference) could play in the Super Bowl, and the game would still be the biggest draw on television. Does this hold true for every game? That is what we are trying to see: whether the NFL is well off week-to-week, no matter who the teams are. The blue line represents the average ticket price for Monday Night Football games over the weeks, while the gray are the TV viewers. The blue line is a good indicator on the market size of the game. The average ticket price will be affected by the market size of the home team, and in a way, the market size of the road team. There are some holes to this theory. First, Green Bay is in reality the NFL’s smallest market, but with their amazingly rich history, have many fans in other cities, and the God-like popularity of the team in Green Bay allows for high ticket prices despite the low population there. The other excpetion is that division games can provide a rise, despite who that division opponent may be. Anyway, by just looking at that graph, you can see that tv viewers (the viewers are across the nation) are really heavily correlated to the average ticket price. This doesn’t mean that the ticket price has any causal affects on viewers, but merely that a national game with high average ticket prices will also have a high number of viewers. The exact correlation is 0.888 (the max is 1.0), which is really high for two events. It seems that big markets do indeed have a positive effect of viewership on a national basis in the NFL. The two notable disconnects in the two lines are the Week 2 and 3 games (Saints @ 49ers and Packers @ Bears), where first the viewership was above what you would expect by looking at the average ticket price, and then the opposite in the Packers @ Bears game. The Saints still having the shine of a defending champion probably is the cause of the fact that the viewership was higher than expected. The Packers @ Bears are huge rivals, but it seems that the rivalry is quite a bit bigger in Chicago than it is across the nation, as the price was really high for the game, with the viewership, while the second highest of any MNF game this year, lower than expected. What may be the most interesting thing to take out from that graph is the plight of that Texans @ Colts game. Again, that game featured two, at that time, 4-2 teams who were a half game behind the idle Titans for 1st place. The Texans have been the Colts biggest rival in the AFC South the past two years as well. Indianapolis is not a big market, but with the amazing success of that franchise, their fans spend like one and usually draw viewers like one. Yet the viewers dropped for that game across the nation, just like the average ticket price did. In looking at what the competitors were, that game had to compete with Game 5 of the World Series. The NFL highly publicized the fact that their Sunday Night game the night before (Steelers @ Saints) beat out the ratings for Game 4 of the World Series, but that was a game with the last two champions, and was on network TV. The NFL also had the Titans @ Jaguars MNF game get higher ratings than an ALCS game on the same night, but again, those two programs were on a level playing field as both were on cable channels (ESPN, TBS). This was the first time that the platforms were not equal. The World Series, along with being the World Series, was on a network (FOX), while the Texans @ Colts game was on cable (ESPN). It sure looks like the World Series took a nice chunk out of the viewership that a game featuring two 4-2 division rivals and Peyton Manning should command. Monday Night Football ratings are really interesting because while Sunday Night has become football’s biggest night, in many ways, the rest of TV has made Monday their night. The highest rated reality show (until Idol starts) is on Monday. The highest rated comedy (Two and a Half Men) is on Monday. Monday has a loaded TV schedule across the networks, and now the football is on cable. It points to football’s strength that its ratings on cable are still better than one or at most two network shows (Dancing is the only show that routinely beats MNF). But the fact that viewers are highly positively correlated to what amounts to market size, might signal that the NFL is not able to take a Titans @ Jaguars game and make it as watchable as any other game. The NFL is still king, but it looks like unless the draw is good, and the market is big, Monday Night is not exactly football night, regardless of the game. Thoughts? Comments? Ideas on why the Texans @ Colts ticket price was so low? Leave us a comment or hit us up on twitter (@SeatGeek). As always, check the main site (www.seatgeek.com), and see where the deals lie. 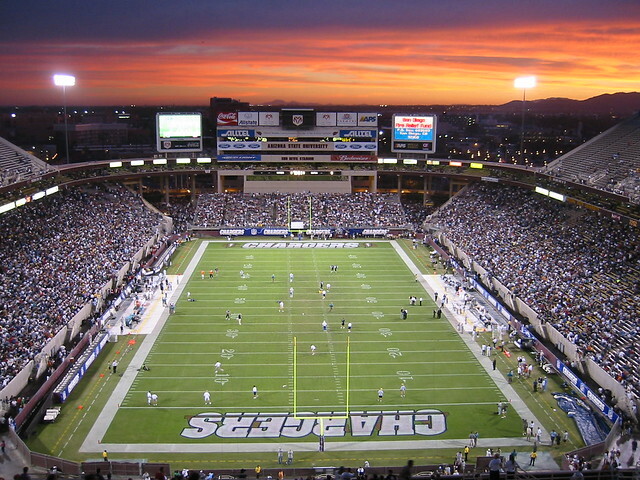 Who knows, you may be able to go to a Monday Night Football game and avoid paying that primetime premium. ‘Till Next Time.